The rib was one of the first tools that Michael started making for himself and then shared with others. 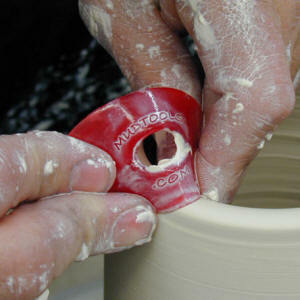 A rib is one of the most basic and frequently used tools in clay. Because it acts as an extension of the potter’s own hand, it should function well and be a joy to use. Our Mudtool ribs are made from a flexible material that is considered the “stainless steel” of plastics. Unlike rubber, this material will not develop burrs or cracks. In fact, these ribs will burnish themselves as you use them, so, the more you use them the nicer they become. Available in six shapes, these ribs cover a lot of what hand builders and throwers need from a rib. Each rib shape is available in four degrees of hardness; from very soft to very firm. You choose the shape and hardness that suits your clay and your working style. Great for compressing slabs, burnishing rims, chamois, and handbuilding. Perfect for smoothing, burnishing, porcelain, throwing, and handbuilding. Great for compressing bottoms, burnishing, trim marks, throwing, and handbuilding. Still Flexible but Stiffer. Great for high burnish and throwing large work. Bowl Rib 4.75" x 2.875"
Bowl Rib 6.5" x 3.5"
Platter Rib 7.5" x 2.75"
Platter Rib 11.5" x 1.75"